The Podcast and New Media Expo is taking place in Ontario, CA. 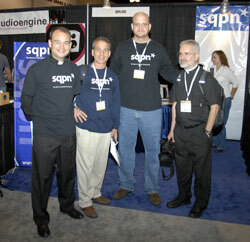 This group, including two priests, are podcasters who are exhibiting in the trade show. SQPN (Star Quest Production Network) is a multimedia organization specializing in the production of audio and video programs faithful to the teachings of the Roman Catholic Church. Its mission is to respond to the Churchâ€™s call to use the media for religious information, for evangelization and catechesis and for formation and educationÂ¹. 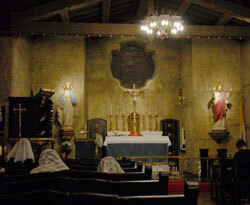 I was able to make it to Mass this morning at St. Secondo D’Asti, a very small church near my hotel. I can’t remember when I’ve seen a Mass with the priest facing the altar and then communion given out at the rail which is still in place. They also have confession before Mass even though it’s at 6:30am.